Ahmad Shawky Muhanna is a Palestinian national. In 1985, he came to the United States on a scholarship from the U.S. Agency for International Development. He graduated from the University of Wisconsin-Madison in 1987 with a master’s degree in civil engineering, and then went on to earn a doctorate degree in electrical engineering from North Carolina State University in 1994. While studying there, he met and married Reem Yousef. In 1995, Ahmad and Reem Muhanna moved to Richardson, Texas, where they still live. In 2002, the Muhannas became legal permanent residents, and in May 2007, they each applied to become a naturalized U.S. citizen. But four years after they first submitted their application the U.S. Citizenship and Immigration Services (USCIS) had yet to schedule an appointment with them. In July 2011, the Muhannas went to federal court to compel USCIS to schedule interviews for their naturalization. That October, they were finally interviewed and both passed their respective examinations. 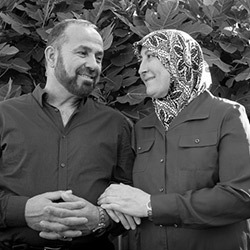 On February 4, 2012, USCIS denied their naturalization applications claiming that the Muhannas had failed to disclose their association with the Holy Land Foundation (HLF), an Islamic charity to whom the Muhannas had lawfully donated money, despite the fact that at the time of the interviews with USCIS, the couple was open and honest with their examining officers about their donations and connection to the organization. In March 2012, the Muhannas appealed the denial of their applications. To date, USCIS has yet to issue a determination on their administrative appeal. The Muhannas’ applications are subject to the Controlled Application Review and Resolution Program (CARRP), a covert government program created in 2008 that makes it all but impossible for many Muslim, Arab, Middle Eastern and South Asian individuals to become American citizens or otherwise obtain legal residency or asylum status. Even though they present no national security concern, USCIS has treated them as such because the Muhannas are on the federal government’s terrorist watch list. They know they are on the watchlist because of problems they experience when traveling. Neda Behmanesh was born in Iran and currently lives in Beverly Hills, California. She came to the United States in 1990 on a tourist visa, and has remained here since that time. In 2003, she married a U.S. citizen and two years later she became a legal permanent resident. On December 8, 2011, Behmanesh applied to become a U.S. citizen. In April 2012, she took her citizenship exam. A short time later, she was told she had passed the test. But in September 2013 USCIS denied her application based on claims that her marriage and residency status both were fraudulent. Ms. Behmanesh filed an administrative appeal on October 2, 2012 submitting evidence proving that USCIS’ claims were false. Behmanesh’s application was also subject to CARRP though the government never revealed that information to her. On August 28, 2013 Behmanesh attended a hearing where she learned that USCIS agent had withdrawn their previous denial and reopened her naturalization application. Ms. Behmanesh is still waiting for a decision on her application. 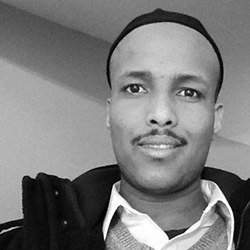 Ahmed Osman Hassan moved to the United States in 2004 after spending 14 years in a Kenyan refugee camp. Hassan, who was born in Somalia and is Muslim, fled his country due to the fear of persecution from the Hawiye tribe. In April 2006, Hassan submitted an application to become a legal permanent resident. In 2009 an FBI agent approached Hassan at his home in Las Vegas, Nevada. The agent informed Hassan that she was aware of his pending application and would be willing to help him if he agreed to work as an informant for the FBI, and report on the Muslim community in Las Vegas by attending local mosques. Hassan declined the agent's request. In January 2011, likely at the behest of the FBI as a consequence of Hassan’s refusal to spy on local mosques, USCIS issued a notice to terminate Hassan's refugee status. The notice says Hassan "may have" misrepresented himself as a member of the Tuni clan. The notices failed to provide any evidence or description to support the allegation. In 2012, USCIS issued a notice to Hassan requiring him to leave the country or be subject to removal proceedings, and denied his adjustment of status for permanent residency application. The FBI’s involvement and USCIS’s attempts to deny Hassan lawful permanent residence are due to CARRP. After requesting asylum at a Canadian border and being held in detention by the Department of Homeland Security, an immigration judge terminated removal proceedings against Hassan in 2013, finding no basis for USCIS’s claims that he was not a refugee. On Nov. 18, 2013, Hassan submitted a new application for permanent residency. His application is still pending. 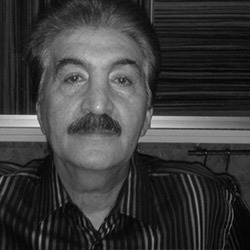 Abrahim Mosavi was born in Iran and came to the United States as a student in the 1970s. He has been a legal permanent resident since 1987. He currently lives in Beverly Hills, California. On November 20, 2000 Mosavi applied to become a U.S. citizen. Seven months later, USCIS informed Mr. Mosavi that even though he had passed the examination, his case was still under further supervisory review. He spent the next decade waiting for a reply. On February 11, 2010, he learned it was denied because he allegedly failed to submit requested information. Mosavi appealed the decision asserting that he had submitted all of the requested information. Once again, USCIS held his appeal in limbo for two years. When he finally received a decision on his appeal, the agency overturned its previous decision but again denied his application, this time for another reason that was factually erroneous. Due to the blatant errors in this decision, Mosavi moved to reopen his case on September 26, 2012. USCIS agreed to reopen it a month later. A year later, in September 2013, Mosavi attended a hearing during which USCIS officials promised a decision within 30 days. Mosavi has yet to receive a decision on his application. USCIS considers him a "national security concern” without explanation.